Art with Heart: Win the Big Shot Plus! Win the Big Shot Plus! 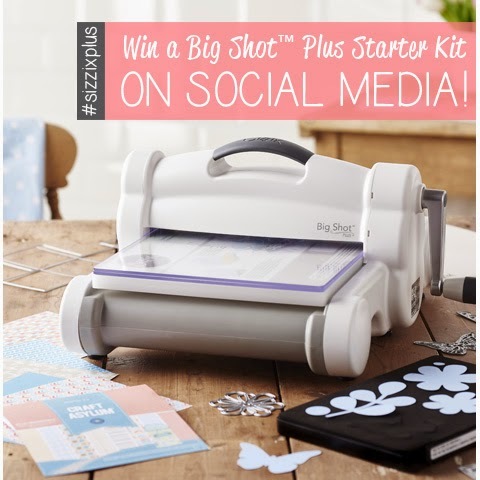 Join us on our social media pages for a fantastic giveaway where you could be the lucky winner of a Sizzix Big Shot Plus machine complete with a Starter Kit which features florals, butterflies and heart designs on Thinlits™ and Bigz™ L along with a Framelits™ die to create a cute box. Along with a new A4 sized Textured Impressions™ Embossing Folder to add more detail to your bespoke creations and patterned paper pads! To enter ‘LIKE’ our Facebook page and ‘Like’ and ‘Share’ our competition post. You can also enter by following our Twitter account @Sizzix_EU and ‘Retweeting’ us! This competition is open to all UK and EU residents. Entries close at 4pm on Friday 8th May. Good luck! можете да надникнете за повече подробности ето тук или на фейсбук страницата им..
Желая ви късмет от все сърце!